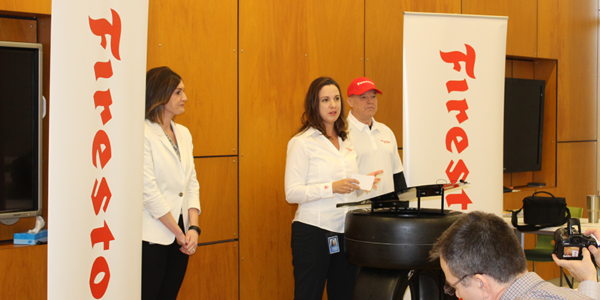 Cara Adams, chief engineer for Bridgestone Americas Motorsports, at the Bridgestone’s Technical Center in Akron, Ohio, sharing details about the company’s plans for a race tire manufacturing plant in Akron. Bridgestone Americas is planning to build a new, state-of-the-art manufacturing facility in Akron, Ohio, that will serve as the future home of Firestone race tire manufacturing. The Bridgestone Advanced Tire Production Center (ATPC) will be located across the street from the Bridgestone Americas Technical Center and less than a mile from the Bridgestone Advanced Technology Workshop, where race tires are currently produced. Plans for the ATPC include both new construction and the full renovation of an existing structure. The news was shared at a special event in Indianapolis that included Indycar and Bridgestone leaders, racing legend Mario Andretti and veteran IndyCar driver and team owner Ed Carpenter. A second event also was held at the Bridgestone Americas Technical Center in Akron with two-time Indy 500 winner Al Unser Jr. At the event, the company also announced a five-year partnership extension for the Firestone brand to continue serving as the sole tire supplier and official tire of the NTT IndyCar Series through 2025. The new tire production center will continue a legacy of tire manufacturing in Akron that began with the founding of the Firestone Tire and Rubber Company in 1900. A team of more than 50 expert tire builders and manufacturing professionals at the Advanced Technology Workshop currently keeps that tradition alive through the production of more than 60 unique race tire specifications for the NTT IndyCar Series season. All race tire manufacturing will move to the new facility over the next four years, and early plans are for the site to produce its first Firestone Firehawk race tires for testing in the NTT IndyCar Series by the end of 2020. Goodyear Tire & Rubber Co. also produces the tires it makes for NASCAR races at its race tire factory at its Innovation Center headquarters in downtown Akron. Other tire manufacturers with a presence in or around Akron, the former “Rubber Capital of the World,” include Kumho Tire USA, Continental Tire the Americas, BKT Tire, LingLong Americas and others.